We are delighted to announce a new opportunity for all of our Facebook fans. 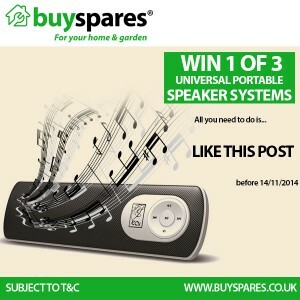 BuySpares is running a competition, where three lucky fans will win a Universal Portable Speaker System. The competition will run for 2 weeks starting on Saturday 1st November 2014 and is planned to end on 14th November 2014. To enter the competition, participants simply have to like the “Win 1 of 3 Portable Speaker Systems” post. Three winners will be chosen at random by BuySpares. All entries must be submitted before 14th November 2014 in the name of an individual person. The prizes can only be awarded to these people whose name is on the winning entry. To enable free delivery by our courier the winners must provide their full name, a UK mainland delivery address with postal code and a mobile number. The prize must be claimed within 20 days of the announcement of the winners. The prizes of the competition is a Universal Portable Speaker System. * This competition is now closed, but you can enter current competitions for your chance to win a fantastic prize, via our competition blog section. We are delighted to announce a new and exciting opportunity for all of our Facebook fans. BuySpares is running a LIKE and SHARE competition, where all fans will have an equal chance to win the big prize. The competition will run for 3 weeks starting on Monday 22th September 2014 and is planned to end on 10th October 2014. To enter the competition, participants simply have to like the BuySpares Facebook page and share the ‘Win a Coffee Maker‘ post. The winner will be chosen at random by BuySpares. All entries must be submitted before 10th October 2014 in the name of an individual person. The prize can only be awarded to the person whose name is on the winning entry. To enable free delivery by our courier the winner must provide their full name, a UK mainland delivery address with postal code and a mobile number. The prize must be claimed within 20 days of the announcement of the winner. 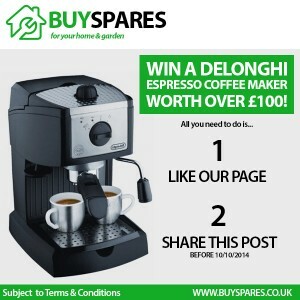 The prize of the competition is a Delonghi Espresso Coffee Maker. 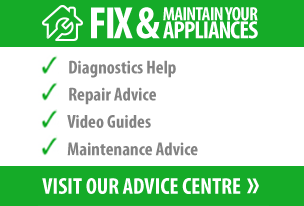 *This competition is now closed, but check our Competition Blog section for your next chance to win with BuySpares. As with all good things, the competition to win a Kenwood Smoothie Maker has come to an end and we’ve selected our winner. The judging process was a rigorous one; first we narrowed down the hundreds of smoothie recipes we received into a “top five” shortlist. We then created our top five smoothies and tasted each one to determine our overall winner! The lucky winner is Linda Osborne with her ‘Strawberries and Cream’ concoction: Melted White Chocolate, Strawberries and Cornish Vanilla Ice Cream. A Smoothie, described in the simplest terms, is a kind of “fruit-milkshake”, blending together a choice of fruits with a liquid base to create a drink with all the goodness and nutrition of eating fruit. An easy way to get your 5 a day, make sure the kids get their vitamin C with minimum fuss, and a great aid to a healthier lifestyle.